Lowdown: The famous musical is brought to the big screen. Nowadays the name Victor Hugo reminds me of the Berne Convention, a cornerstone in today's implementation of copyright legislation. In my younger years, however, I knew Hugo mostly through a French TV series starring Jean-Paul Belmondo. That series seemed to last forever and told the story of a bunch of people that always seemed to get the wrong end of the stick. It was called Les Misérables. 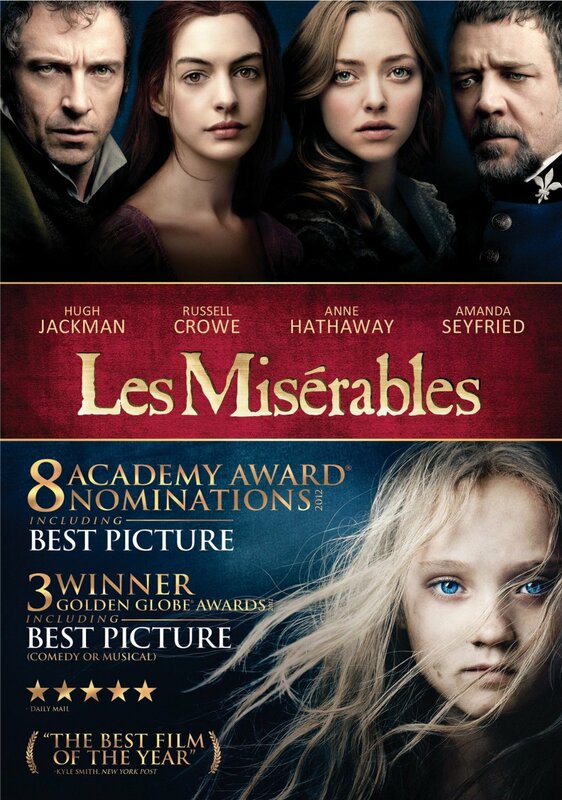 Les Misérables, the 2012 version, is a far cry from that Belmondo series. Instead of bringing the book to the screen, it brings the musical based on the book to the screen. I have never seen that musical, although some of its songs are famous enough for me to recognise during the movie. The main point, however, is Les Misérables not being your average musical; it takes things further. It's not like the actors burst into song from time to time; the actors are always singing, even if they just tell one another "how are you" or "g'day". And that, my friends, is something I can hardly tolerate, let alone when stretched over a slowish two and a half hours movie. Our plot tells us of Jean Valjean (Hugh Jackman), a prisoner set free at the beginning of the film after doing his time. Valjean is no ordinary ex-prisoner: his crime was stealing a loaf of bread to keep a child alive; his sentence was a harsh one, harsher than usual, because he tried to escape. Because of this breakout attempt Valjean is ordered by a police chief, Javert (Russell Crowe), to attend to a parole officer on a regular basis. Valjean finds refuge at a church but steals its candle sticks; upon getting caught, the priest lies to the police and says he gave the candlesticks to Valjean. Because of that noble act, Valjean vows to change his ways. He breaks parole and assumes the identity of a fictitious person. Next time we meet him he's a rich mayor with his own factories. In one such factory works Fantine (Anne Hathaway), whose beauty makes her the subject of the other employees' jealousy. Valjean fails to pay attention to her as she is fired and then turns to prostitution; he only notes her when she dies and leaves a young daughter behind. Annoyed at his carelessness, Valjean vows to look after the girl; however, he has to keep an eye out for Javert, who is always a step behind. Thus begins our story, a story that involves French revolutions and many more famous actors (Sacha Baron Cohen, to name a fine example). Alas, as I have already said, unless one is in the mood for dialog to be sung, one is in a bit of a problem. Personally, I had a big problem: although the end of this ordeal does bring some excitement into the air, the general state of mind is that of a bore-fest. I will add my failure to understand the fuss around some of the performances here. Crowe seemed a bit strained when singing, but what's with all the fuss around Hathaway's performance? Aside from cutting her hair short I could find nothing extraordinary there. Just another brick in the boring wall of dialog singing. Overall: Wow, I could not believe how hard it was for me to survive watching this one through. 1 out of 5 stars; only watchable to lovers of extreme musicals.